Athens native Ioanna Vamvakouri came to Santorini when there was only one other winemaker on the island. Venetsanos Winery, seen along the edge of a cliff, was built above a port to enable direct access for shipping its wines. Ioanna Vamvakouri shows some of the wines she makes at her Venetsanos Winery on Santorini. Perhaps it was in her blood and being a winemaker was meant to be. Ioanna Vamvakouri did not grow up in the wine world but, growing up in Athens, she remembers filling the wine jugs at the local shop for her parents and falling in love with the aromas. She remembers being mesmerized listening to the old man at the shop talk about the wines. When she was in high school, chemistry was so easy for her she decided to study it, but with a focus on wine. Vamvakouri spent two years in Athens and three years in France studying enology. She knew Greece had old vineyards and old traditions but saw that there were new techniques and technologies to incorporate. 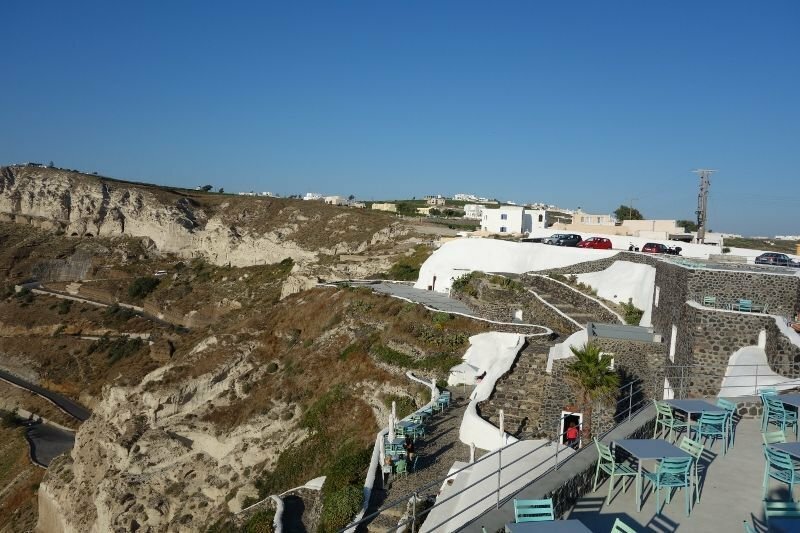 One week after receiving her diploma in June 2004, on her teacher’s recommendation, she went to Santorini for 20 days of lab work at Santo Winery. It has been 11 years and she has not left the island. After two years (2004-2005) analyzing wine in the lab and assisting the enologists at Santo Winery (2004-2005), Vamvakouri moved to Boutari Winery where she spent nine years as head enologist at the Santorini property. But, at the end of 2014, at the age of 36, Ioanna felt that it was time to do something on her own. With 11 harvests under her belt, she knew that she still has things to learn but had her own ideas. For example, while there are currently no vineyard classifications in Santorini, Vamvakouri recognizes that there are different terroirs on the island. “With the diversity of the terroir on the island, I believe the vineyards are totally different,” she said. “With the explosion of the volcano, the ash covered the island in different ways. Altitudes vary and rain is different on the other side of the mountain.” To explore this concept, she wants to vinify each vineyard separately. And she now has the winery where she can try this — at Venetsanos Winery. Venetsanos was the first industrial winery in Santorini and the Cycladic Islands. The Venetsanos family, who were originally from Santorini, moved to Egypt where they had a pharmacy but also sold wine. They returned to Santorini in the late 1920s, and son George Venetsanos became the first enologist on Santorini. While George had studied chemistry, with a focus on enology, he had wanted to be an architect and used that passion to design the winery between 1947-1949. He built the winery inside a cliff above the port to enable direct access for shipping, as well as to utilize gravity flow. The winery was in production until 1979. Santo Wines used the space until 2000, but the winery was generally vacant. In 2014, as Vamvakouri began thinking about her next steps, she reached out to the mayor of Santorini, Nikos Zorzos, and his brother Vangelis, a teacher. As nephews of Venetsanos, they were the owners of the empty property. They were beginning to look into selling the property, and Vamvakouri approached the mayor and said that while she had no money, she knew how to make wine. He said he would speak with his brother and get back to her. So, a week later, Vamvakouri called back, surprising the mayor who had not yet called his brother. She took charge and said she would call Vangelis and the next day, a Sunday, she met the brothers and presented a business plan. The mayor had re-election two months later and told her that he could not make a decision but asked her to run for the council. She agreed to run for office, but as a non-native to the island, she warned that she might only get votes from her few relatives and friends, totaling 13 votes. In the end, she received 580 votes. “If I want something, I can be persuasive,” she explained. After elections, Vamvakouri’s persistence paid off when she offered to keep the name of Venetsanos, and the Zorzos brothers, who liked that she wanted to keep the family name, accepted her offer. While Vamvakouri’s deal with the Zorzos brothers was made in September 2014, she had already decided in July 2014 to make wine from the Venetsanos vineyards, 10 hectares planted across seven or eight vineyards spread around the island. She had bought the grapes, telling the brothers that she wanted to make three tanks as a side project at Santo Winery, as they were buying the grapes as well. She figured that, at the very least, if the deal did not go through, Santo Winery would use the wine. When the deal went through in September, she surprised them by announcing that they would open their doors with wine from the 2014 vintage. Renovations begin in September 2014 and Venetsanos Winery reopened its doors on May 5, 2015, with 13,000 bottles of wine in stock. When Vamvakouri first started working at wineries on the island as a 25-year-old woman, the 50-year-old men that she worked with saw her as a little girl, not as their boss. “I had to work three times as hard as any of the men to persuade them that I could do it,” Ioanna recalled. “You can tell them to clean it this way or do it that way but they do not want to so you get in the press and do it yourself. Then the next time they say OK.” Ioanna worked hard and it took one year to gain her male colleague’s respect and today she is highly regarded on the island of Santorini. When Vamvakouri first came to Santorini, there was only one other female winemaker on the island. Today there are many women on the island working as enologists, agronomists and viticulturists. Vamvakouri is the only woman running a winery. “I want them to understand that I know my job and that is why I want something done. If they know why, they do it with more pleasure,” she said.